Cuckoo for Coconuts: I WANT CANDY! FOOD, GLORIOUS FOOD... well... er... uh well it used to be food. 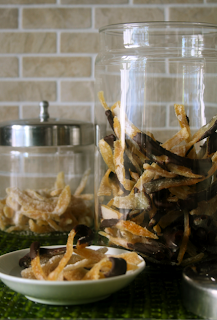 After squeezing 17 lemons - half of them the size of a grapefruit and 18 oranges yesterday, I thought I would try my hand at making candied citrus peel. Here is the lemon version, half of which I dipped in a dark chocolate. It is fairly easy to do, except for the removing of the pith by running a very sharp knife between that and the skin. The pith is the dry white part lining the citrus. Once all of that is finished then you boil the peeled 1/4" strips for 20 minutes then drain and boil once more. Next, take 1 cup of water and 2 cups of sugar and boil with cooked peels about 45 minutes stirring constantly... you do not want this to scorch. The peels should now be somewhat transparent and firm... from all the sugar. Remove and spreed over a parchment lined cookie sheet - let drain/dry for about 10 minutes. divide into small groups and place in a covered bowl or bag and toss with 1/4 cup superfine sugar until evenly coated. If too wet the sugar will clump instead of dust the surface. Then dip each one in a bit of chocolate... or you could lay them all out on a cookie sheet and drizzle with the chocolate. The boiling yummy sugary sweetness. 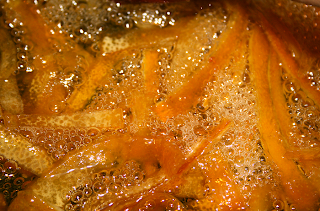 Save the syrup that boils down (now lemon flavored) and store it in the fridge where it will last quite a long time. It's perfect for ice tea or even on ice cream. By the time I went to bed, I was so hopped up on sugar that I was awake half the night. But it was worth it... this is the best candy ever!!!!! Tomorrow I am going to make and orange and a tangerine version. While we are on the subject of sweets.... here are pics (for mom) of our desserts from the tasty meal at Mama's Fish House on Friday night. 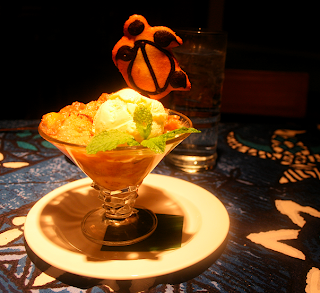 I had the Liliko'i Creme brulee and John had the Banana crumble with Tahitian Vanilla ice cream. 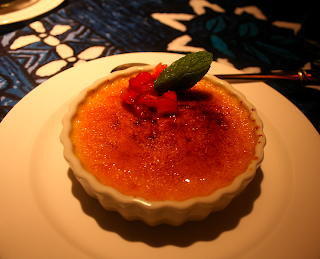 Can you taste the Liliko'i creme brulee mom? Thanks again for the treat! Aloha, Sweetness! Bring the car around.